Maxine Stephens Pierson, 93, passed away Tuesday November 15, 2011, at her home in Tuscola. Service will be held at 2:00pm, Friday November 18, 2011 at the Tuscola Church of Christ, officiated by E.J. Chafin. Burial will follow in the Tuscola Cemetery, directed by Fry ~ Bartlett Funeral Home. A visitation will be held from 6:00 to 8:00pm Thursday evening November 17, 2011 at the funeral home. Maxine was born in Choctaw County, Oklahoma on September 25, 1918 to Walter and Gladys Stephens. 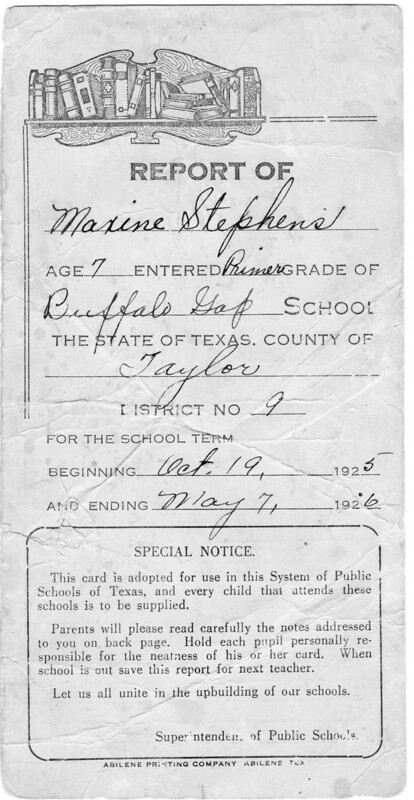 She graduated from Wylie High School in1937. Maxine married Richard Pierson December 18, 1940. They resided in Tuscola where she was a homemaker and raised three daughters. She was a member of the Tuscola Church of Christ and a charter member of the American Legion Auxiliary Post 664. Maxine was preceded in death by her parents, her husband Richard, a son Stephen Pierson, grandsons Ronnie Waggoner and Adam Swaim, sister Inez Pierson and brother Whizzer Stephens. Survivors include her three daughters, Nancy Storie of Abilene, Kathy Swaim and husband David of Tuscola, and Tommy Ann Waggoner and husband Gerald of Tuscola, six grandchildren Terry Swaim, Gary Ashwander, Bonnie Coxe, Shirley Hay, Richy Waggoner and Betty Swaim; eleven great-grandchildren, Stephanie Swaim, Tiffany Coxe, Meredith Cook, Allison Swaim, Wesley Paul, Kenan Waggoner, Lane Coxe, Aiden Waggoner, David, Leah and Sadie Barham. She is also survived by two sisters, Cora Lee Ross and Peggy Yown, brothers Tuck, Bud and Red Stephens, several nieces and nephews, and many friends. The family wishes to express sincere gratitude to Hendrick Hospice for the care, kindness and love they showed our mother.